Frustules almost always come to rest in girdle view, a view which is dominated by highly arched bilobate keels. The keels are strongly torsioned so that only one lobe is in focus at one time. In complete frustules in girdle view, diagonally opposing lobes lie at approximately the same level of focus. Lobes are flattened in large specimens and more rounded in smaller specimens. Several girdle bands are present, each with a linear series of short transverse dashes that appear to cross at mid-valve. The junction line between the valve and the keel is marked by a series of prominent and irregularly shaped bulges or swellings. Striae on the valve face continue onto the keel. Areolae within a stria on the valve face are very fine and number 26-30 in 10 µm. 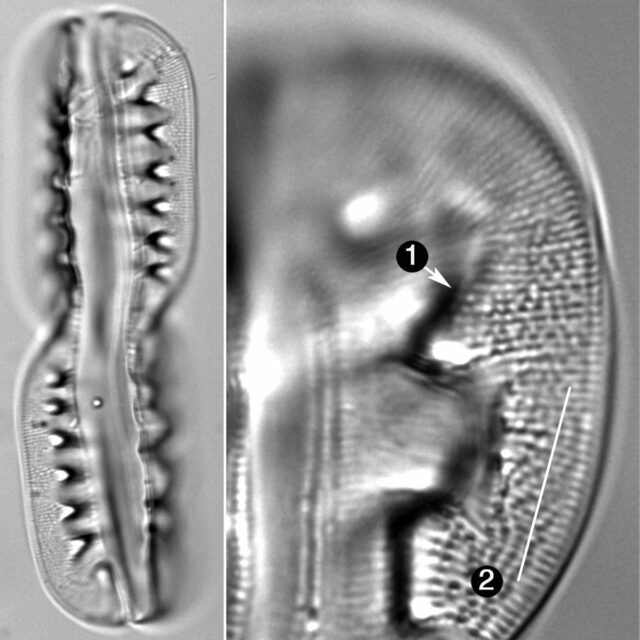 Areolae within a stria on the keel are more prominent and number 14-20 in 10 µm. In Montana, Entomoneis ornata has been found in 23 lakes, marshes, large rivers and small creeks, both east and west of the Continental Divide. These waters have an abundance-weighted mean pH of 8.1 and an abundance-weighted mean specific conductance of 2188 µS/cm, which is considerably lower than the conductivity preferred by other species of Entomoneis. But like E. alata, E. ornata prefers waters with elevated concentrations of sodium and sulfate. 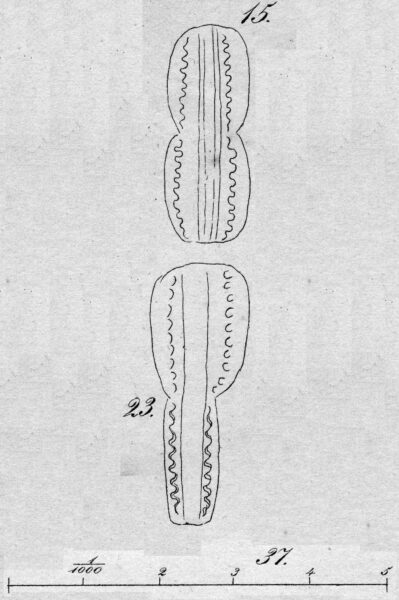 Common diatom associates of Entomoneis ornata include Gomphonema turgidum, Gomphonema coronatum, Neidium iridis, Placoneis explanata, Cavinula jaernefeltii, Stauroneis heinii, and Nitzschia obtusa. Patrick and Reimer (1975) report this species as widely distributed in in the United States in larger lakes and rivers, where it is an oligohalobe and "indifferent" to small changes in ionic content. 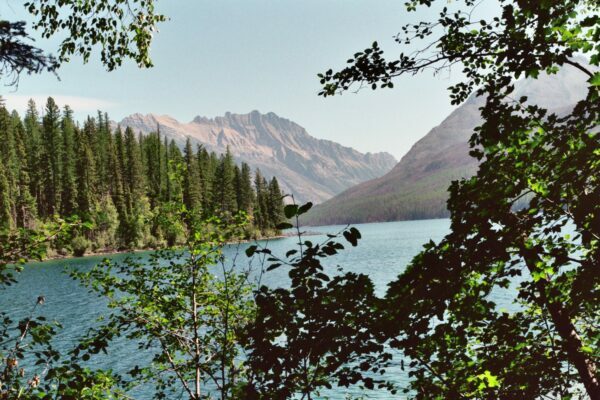 Kintla Lake, Glacier National Park, Montana: home of Entomoneis ornata. AMPHIPRORA ORNATA, B. Pl. 2, figs. 15 and 23. Small, deeply constricted, ends truncated and rounded, sides marked with a longitudinal row of undulations or pinnulæ, as in Surirella. Often contorted. The ruffle-like rows of pinnulæ distinguish this species from all others. It probably has minute striæ also, but I did not have an opportunity to examine with high powers. Hab. Withlacoochee River, where it is crossed by the road from Pilatka to Tampa, Fa. Bailey, J.W. (1851) Microscopical observations made in South Carolina, Georgia, and Florida Smithsonian Contributions to Knowledge 2(8): 1-48. Entomoneis ornata has a junction line composed of a few large and irregularly shaped swellings. Striae number 20-24 in 10 µm. Areolae within a stria are more widely spaced on the keel than on the valve face.